As I mentioned before Samsung is going to unveil their latest phone of Note series in first week of August. Note 7 is said to have a huge 5.7 inch display. Its screen will be curved and it will be QHD super AMOLED. The back camera is said to be of 12 Megapixels along with a 5 Megapixels front camera. It will be running on latest Snapdragon or Exynos processor. There will be 6 GB RAM to support the processor. It is said there won’t be any 16 GB or 32 GB model. Basic model will have 64 GB of internal storage. It will have support for external card and UFS hybrid memory card slot. Battery will be of 3600 mAh. 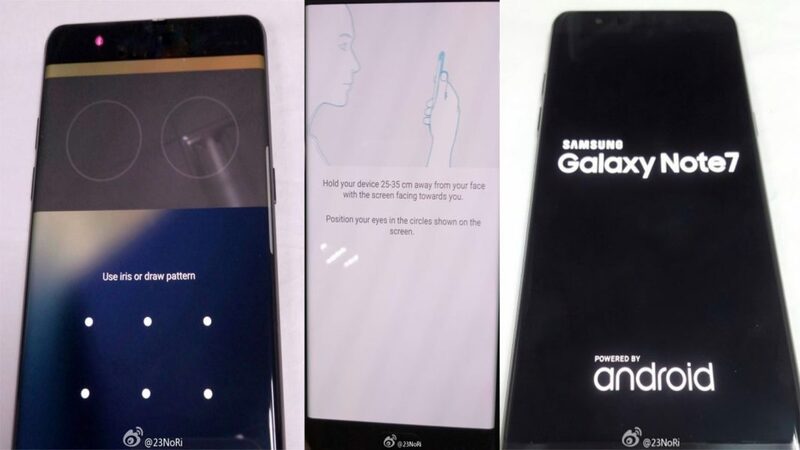 Along with the specs there are also some pictures of iris scanner revealed in the leaks. Its something new that Samsung is going to introduce in Samsung Galaxy Note 7. In the pictures below you will notice that the user has to place the phone at arm’s length from the face, while screen facing his face. Also that user has to look directly into the circles present on the screen and then the phone will run iris check and process the the image. As of yet, we have no information regarding the iris recognition applications. We don’t know if it be used only for phone locking and unlocking along with Samsung pay or it will be available to use for third party application. Thats all the we know about upcoming Samsung Galaxy Note 7 IRIS scanner. We will update this post as we hear more from the news and rumours. Let us know about your expectations from the upcoming phone. Also tell us if you are going to switch to Note 7. Have you made any decision yet? MetalHead \nn/ | Balochistan |Uz garzam lewanay | Deutschland | Software Engineer | For questions, contact me on Facebook! Best apps from XDA forums. iTechify is all about Android operating system, its news and guides. We provide you with the latest news and guides regarding Samsung, Apple, Huawei, Nexus, LG and Huawei devices.